I am preparing to play an Anglican pastor/priest at a live-action role-playing game. The (pretend) location: an English colonial outpost in the Caribbean. The (pretend) time period: circa 1695. And the game, of course, is about pirates. I am a real-life Anglican in Ireland, but I am having trouble finding information specific to the time/situation. First and foremost: what would such a person wear? Something flowing, resembling a Catholic priest? Something more resembling a modern suit - then what's the critical difference, so my costume can look authentic, not modern? Also: what kind of beliefs, "churchmanship", would he be likely to espouse? Latitudinarianism, an early doctrine of tolerance, already existed in Anglicanism, but would it be normal for a rank-and0file pastor/priest to hold to it? And, by the way, would he and those around him refer to his position as "priest" or "pastor" or "minister" or something else? I was somewhat unsure whether to ask here or on the Christianity Stackexchange but decided to try here :) Plesae do tell me if I should ot there instead. John and Charles Wesley were Anglican pastors who made a somewhat similar trip to the Americas about 40 years later than your designated time. However, they may be somewhat useful models in that they later became famous enough that all kinds of media were made (and importantly disseminated up to this day) depicting them doing so. 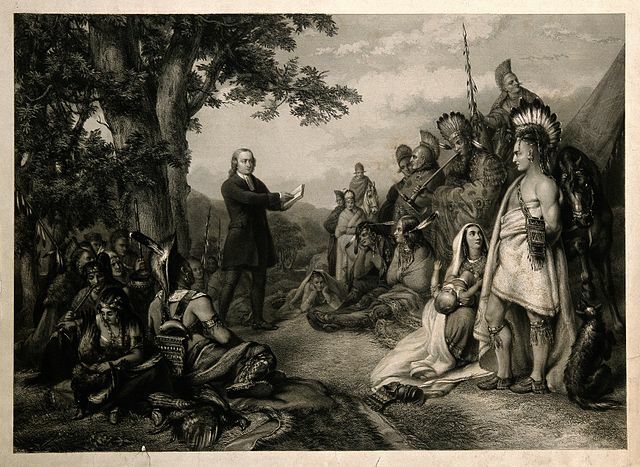 Here's an engraving of Charles preaching to Native Americans in Georgia. I've found lots more, but they all seem to depict the man the same way: wearing all black, with a coat and either an ascot or a very short white stole. He's usually shown wearing riding boots, as preachers in the New World typically needed to travel long distances on horseback. But on occasions where he wasn't, it was black shoes and black hose. His brother Charles is always shown in pretty much the same outfit, so this appears to be the uniform. As for doctrine, you can be somewhat loose here. This was a time where the Church of England was exploring itself a bit theologically. As long as your preacher doesn't embrace any of the strongest tenets of Calvinism (or Heaven forfend, Anabaptism), you should be OK. Wesley himself, despite some interesting Moravian-inspired views, was an Anglican all his life*. He really only ended up founding a new denomination in the USA because of the timing of that country's political separation with England. Latitudanriansim in particular seems to have been mostly a useful operational theology to allow for annoyingly large differences in doctrine in the various parishes. But that being the case, there were likely individual parish priests who legitimately subscribed to it, particularly if they were educated at one of its source universities (eg: Cambridge, or one of the Scottish universities). Its also mentioned that it was even more practical in the Americas, because there was no nearby authority that could enforce conformity anyway. * - His alternative was the Quadrilateral, which attempted to reconcile reason with scripture, tradition, and experience. I'm sure dedicated latitudinarians considered this a conservative cop-out. Not the answer you're looking for? Browse other questions tagged religion christianity colonial-america 17th-century protestant-church or ask your own question. Did the legal principle of conflict of interest exist in the 17th century? 17th century Japanese colonies in Southeast Asia? What did the top minds of the late 17th century have to say about Salem witch trials?